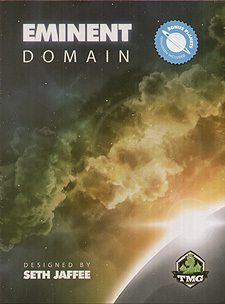 Eminent Domain is an Empire building strategy game for 2-4 players. Your Empire is represented by a deck of cards that changes over time. As you play the game your Empire will get better at some things and worse at others. Eminent Domain is unlike any deck building game you've seen before! Action: Play an action card only you can use! Role: Lead a Role - your opponents can Follow or Dissent! Cleanup: Manage your hand to prepare for future turns! So then the wonderful world of conquering planets to form your empire has come about in this nifty little quick-to-learn and quick-to-play game. After playing your initial game through it is a fairly simple game that seems very addictive. Writing about it now makes me want to play it. The aim of the game is to get as many points as possible and these are counted from the planets (there are categories) that you acquire, the resources you produce and the cards that you play. The play comprises the dealing out of a deck from which the players draw a hand. On the table are several piles of action (role) cards, technician cards (which accentuate other cards you play) and planet cards. There are also resources and spaceship fighters. Planets are acquired by either force (using fighters collected from the warfare role) or by benevolent means (researching and surveying). Different types of planets are denoted by symbols and may only produce specified resources. Some planets produce more than others and some produce a variety of products to trade. From this players can produce or trade resources. Production of a resource has to be carried out in order to subsequently trade resources. I can�t go on anymore without sounding like a rule book but the essence of play is there. The more expensive the planet is to aquire the more resources it produces or the more points it is worth. All points are added up at the end of the game (determined by central stack depletion) and the one with the most wins. Now then I have seen many reviews on-line. I bought this game at the Autumn Beer N Pretzels of Spirit Games fame and waited until Christmas to play it as I was conscious that I had spent a lot of money on games this year.... Nonetheless it did not stop me reviewing it. I was very disheartened by some reviews calling it a mixture of Dominion (I like), Race to the Galaxy and Puerto Rico (both of which I have never played). Reviews mumbled such noises as �not versatile�, �lack of variability� and such like ultimately the variability and dynamic comes down to the choices you make and the �tech cards� you pick up. For me, the game had a good level of variability, but it was never going to be Dominion. Gameplay is around 45 to 60 minutes and it goes quickly. It is fairly straight forward to understand and within a few hands of your first game you have a good handle on how it all works. Three or four people who have never played the game can quickly get into the strategy. Children get into these games very quickly. As for the packaging it is pretty good. Not outstanding, not terrible. Some wooden chips for resources that are quite nice, some cool plastic spaceship counters (in 3 handy sizes for various denumenrations) and the cards are pretty cool too with awesome artwork and interesting actions and roles. It has a pleasing aesthetic value and is nice and tidy. It�s a game I enjoy, I might not play it all of the time to the point of exhaustion, however , it will come out on the standard games day along with Dominion, Pandemic, Fluxx and Carcassonne. I thoroughly enjoyed it and will happily give anyone a game if they fancy one. Like any game I rarely win, but I thoroughly enjoyed not winning, to me that is as good as winning.